Human Cases Of Bird Flu In China Draw Scrutiny : Shots - Health News Sixteen cases of a new flu in China have touched off a major effort to determine what kind of threat it might be. Flu experts want to know where the H7N9 virus is coming from and how it gets around. 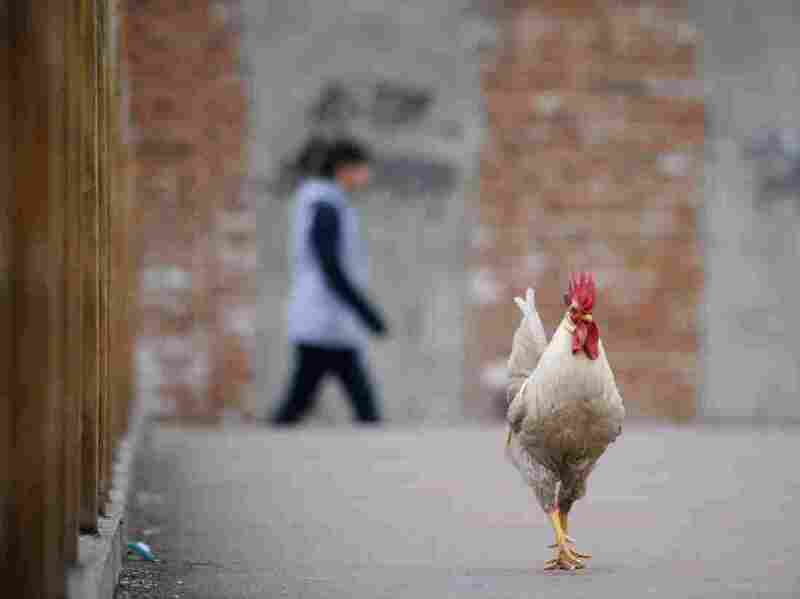 A cockerel walks on a bridge in a residential area of Beijing. The Chinese are beginning to destroy thousands of birds in an effort to stamp out the presumed source of H7N9 infection. Sixteen cases of a new flu around Shanghai have touched off a major effort to determine what kind of threat this new bug might be. The victims range in age from 4 to 87 years old. Six have died. It is a tragedy for them and their families, but is it a global crisis? To understand why so few cases are generating so much concern, the first thing to know is that no flu virus like this one — called H7N9 — has ever been known to infect humans before. That immediately grabs the attention of flu pros. "Since it doesn't affect people, people haven't developed immunity to it," says Thomas Frieden, director of the U.S. Centers for Disease Control and Prevention. A lack of immunity among humans is one key ingredient of a pandemic. The other is a germ's contagiousness. "Does it spread readily from one person to another? Everything we're seeing at this point suggests that is not happening," Frieden said during a Friday afternoon teleconference with reporters. Since the new flu emerged last weekend, Chinese authorities have tracked down 100 close contacts of the 16 flu cases. They're chasing at least 300 more. Frieden notes that none of the close contacts have developed flu symptoms. "In influenza you would expect at least 20 to 30 percent of family members to develop illness," he says. "So the fact that there are that many contacts and no illness has been identified is encouraging." Actually, his statement needs an asterisk. Two adult sons of the first identified case, an 87-year-old retiree known as Li, had severe respiratory illness and one died. Both tested negative on tests for H7N9, but that's not conclusive. There are a number of reasons why a sample might falsely test negative. Unfortunately, the surviving son has reportedly refused a re-test. Chinese authorities are said to view the two sons as "probable" cases. Conceivably other negative tests could be wrong, too. But the larger point is that epidemiologists really begin to worry when a virus begins to spark a chain of person-to-person transmissions. So it's reassuring that Chinese surveillance has so far discovered no spike of influenza-like illness in Shanghai hospitals and clinics or in the four surrounding provinces where H7N9 cases have been recorded. Still, the public health community would be a lot more comfortable if it knew where this unique strain of flu is coming from, and how it's been getting into humans. "The most important thing is to try to understand how this virus gets around," World Health Organization spokesman Gregory Hartl tells Shots. "We need to know the behavior of this virus in order to know how to control it." It's a bird virus, not a mélange of bird and pig viruses the way the pandemic H1N1 flu virus of 2009 was. But this H7N9 doesn't kill birds or even make them very sick. So it's hard to track through infected flocks. The new H7N9 has been evolving under the radar for quite some time, picking up mutations that allow it to infect mammalian cells, including ours. Nancy Cox, the CDC's top flu virologist, says viruses obtained from the first Chinese cases are only 95 percent similar to previously known H7N9 viruses. That may sound pretty close, but in the flu world it denotes a good deal of evolutionary change over time. Moreover, Cox tells Shots, "there are some molecular markers or genetic sequence changes — allowing the virus to bind to molecules on the surface of human respiratory cells — that would indicate these viruses might be able to infect humans more easily than, for example, the H5N1 bird flu viruses." That's ominous. The H5N1 virus is among the deadliest flu viruses known, although thankfully it has failed (so far) to acquire the ability to spread easily from human to human. But Cox later emailed to say that the genetic markers she was referring to are not the only genetic features "that determine transmission from human to human." Those other features "are less well understood," she writes. In the absence of person-to-person spread, the best bet to explain the sudden, widely scattered cases of H7N9 in southeastern China is that people are catching it from poultry. Frieden notes it has been found so far in pigeons (a market item in China) and chickens. So the Chinese are beginning to destroy thousands of birds in an effort to stamp out the presumed source of infection. They're also testing many other animal species in an attempt to find other vectors or at least potential genetic mixing vessels where a more dangerous H7N9 might be incubating. Meanwhile, Cox says she's trying not to waste energy merely worrying about the problem. "All of our energy is going into being prepared for whatever might come," she says. The virus might become a public health threat. Or it might fizzle out. "Either is possible at this point," she says.